Here in Gyeongju, at one of Korea’s few pottery studios that uses a wood-fired kiln, the day the kiln is fired up is the talk of the town. To watch this taking place is a special and rare occasion, one that only happens four or five times a year at the most. At the southwestern-most tip of Gyeongju, there is a village called Bakdal. In fact, if you travel just a few hundred meters from the sign that welcomes you to Bakdalyo, you will no longer be in Gyeongju proper. 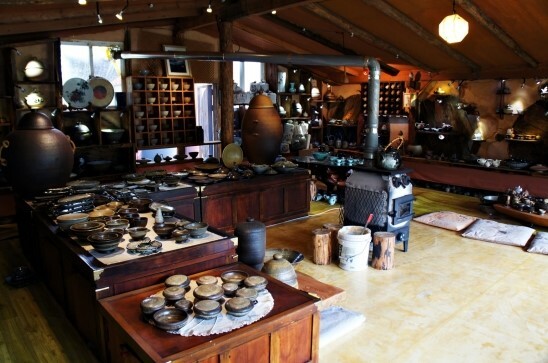 This village is home to the studio of 정성환, a member of the Korean Masters Association who is a crafter of teapots. 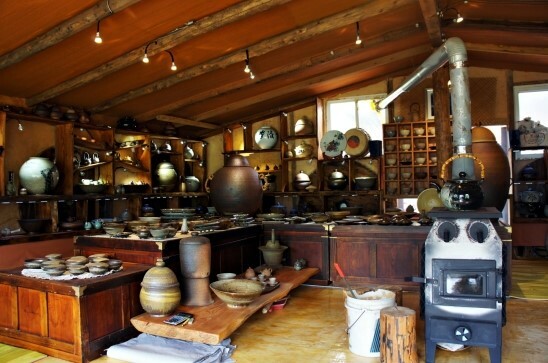 After hearing about the occasion of the kiln being fired up, I made my way to 정’s studio, called Bakdalyo, with great anticipation and no concern for the distance I had to travel. I was greeted by the scent of baking clay and the powerful fragrance of tea. Even as I was smelling them, these aromas had already aroused my nostalgia, and I spent an entire half-day there before I could pull myself away. How many people are lucky enough live their lives with the utter certainty that they have found their true path? It may be apocryphal, but Korean people quote Jean-Paul Sartre as saying “Life is between B and D, and is C.” This suggests that, between birth and death (B and D), life is about countless moments of choice (C). As we make choices and experience regrets, not everything can be perfect. But life is about experiencing small rewards every time we make choices. That’s how it is for all of us. Master craftsman Sung Whan Chung, whose sobriquet is “Seok-cheon,” has enviably found his path. His work is to form clay and bake pottery. 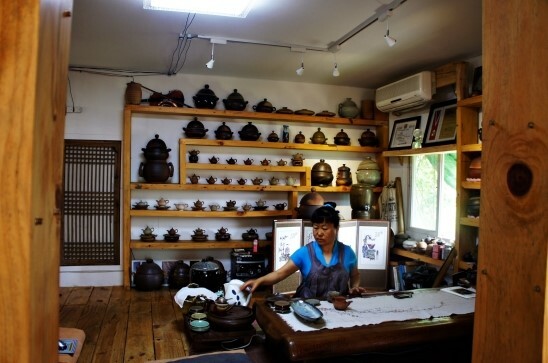 He is the third generation of his family to take this path, following the footsteps of his father and grandfather, who ran a large pottery studio near Haeinsa temple in Hapcheon. It may not have been his choice to continue this family tradition, as he met with hard work and challenging, hungry times. Through the trials that befell him during the 1990s IMF crisis, still fresh in his memory, and the ten years that by chance he wound up spending in Bakdal village, he has never been without clay in his hands. 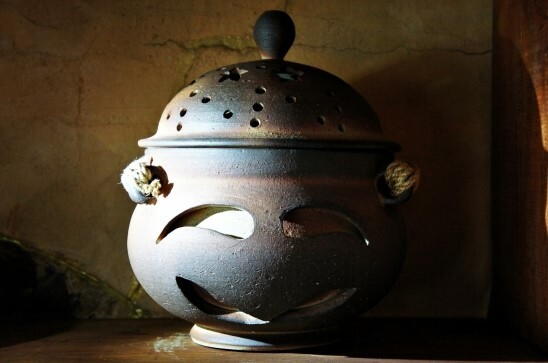 Through these many years, Master Chung’s key creation—‘his thing’—has been the teapot. Having identified ‘his thing’ through endless trial and error, he rose to the rank of master artisan. The teapots that he makes are different from other teapots. These crocks have two lids. This structure is well-suited to hold fermented teas, like pu-erh. When it comes to fermented teas, which gets better the longer it steeps, Master Chung says the most important thing is to maintain a low level of humidity. So, a flat lid is placed on the pot first to block moisture, and a higher convex lid is added on top of that for additional protection from moisture. This extracts the best flavor as the tea steeps. After being stoked at six o’clock in the morning, the fire in the kiln is burning steadily, with no respite. The kiln, which can be fired for up to twenty hours and no less than fourteen, can reach the almost unimaginable temperature of 1300°C (2372°F). Even if you manage to sit for short periods, tending the kiln fire is a tiresome task that requires getting up continuously just to add a couple more pieces of firewood. 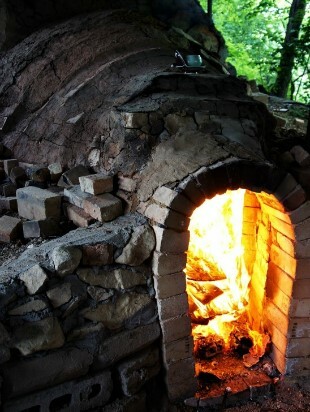 One name for this kind of kiln is neoguri-gama, which actually means “raccoon kiln.” This is a phonetic play on the Japanese word ‘noborigama’ (登り窯), or ‘climbing oven. Ceramic ware is placed in the kiln’s three ascending vaulted chambers. As the fire gradually climbs higher and higher from the entrance, Master Chung says each chamber must be stoked separately. 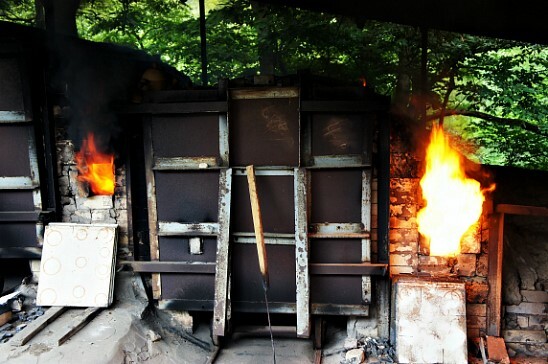 In Korean, this multi-chamber kiln firing process is called kanbul-ddaegi. The day I went, I was fortunate enough to observe kanbul-ddaegi. It was time for the ceramic ware in the first chamber to be fired. This was a full ten hours after the fire had been stoked. 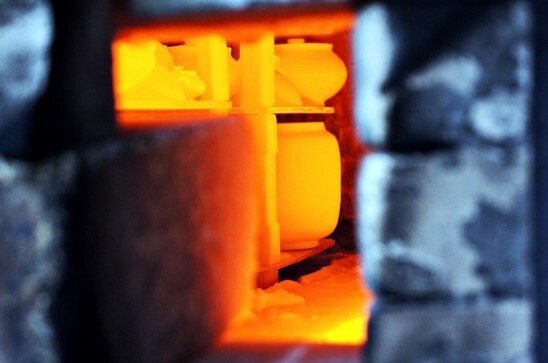 The fire was glowing white within the kiln, well over 1200°C (2192°F). It was my first time to see a fire that was really, truly white. It is purely by intuition that Master Chung determines when all the variables within the kiln are right for the transition from the first chamber to the next one. 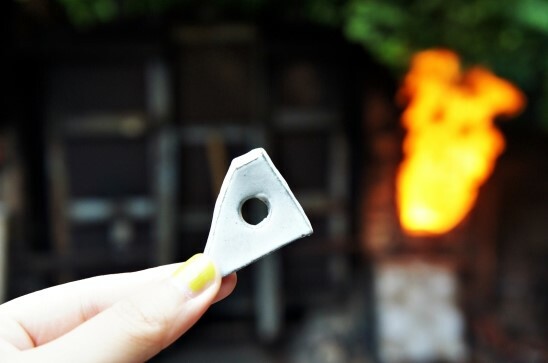 Nevertheless, just to be quite sure, he puts in a small triangular test piece. When this little guy takes on a dazzling luster, confirming readiness for proper firing, the next chamber is ready to be fired in its turn. He says that the clay used at Bakdalyo is a combination of base soil and clay that he collects personally. The two are pulverized and mixed using a rice flour mill. He also makes his own glaze that is free of chemical additives. That probably explains why each piece emerges with its own distinct personality, hue, and texture. It is a truly special experience to observe firsthand how the combination of clay and fire results in a teapot as hard as a rock. The flames may lap at the pottery and ashes may stick to it. Whatever happens, so be it: the process naturally imbues the glaze on each piece with its own distinct character. In this way, the pottery at Bakdalyo comes to reflect nature. The Bakdalyo studio features an exhibition hall. 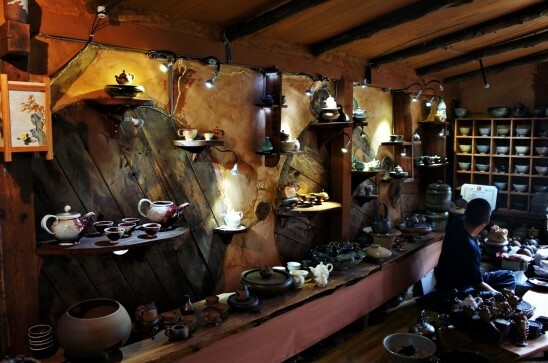 Master 정’s residence, the exhibition hall, the studio, and even the kiln are all his own handiwork. After arriving here during some tough times, he restored a tile-roofed house that was more than sixty years old, hammering away all by himself. 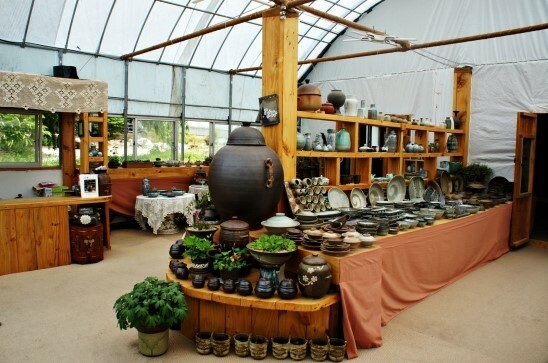 He even made the wooden shelving in the exhibition hall where the pottery is displayed. He says that when he was working on the house, he found a large, round wooden cable spool abandoned in the neighborhood. He picked it up and attached it to the wall of the exhibition hall, showing off his interior design aesthetics. His manual skill in woodworking is as impressive as his skill in handling clay. 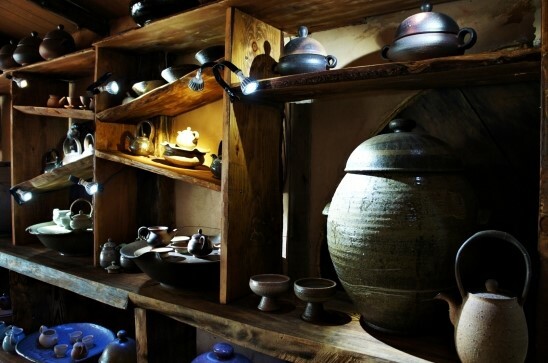 01 | The exhibition hall for viewing pottery doubles as a teahouse. 02 | How much better can it get, being served a nice fragrant cup of tea, over and above a chance to examine these works of art? Even if you are absolutely determined to see the teapots at Bakdalyo, you might get worn out on the road to faraway Bakdalyo. In that case, let me tell you about the Bakdalyo exhibition hall in the Namsan Mountain area. ^^ It is managed by Master Chung’s wife, Soon-ok Lee. If you happen to be hiking the course that includes Mangweolsa temple on the western side of Namsan Mountain, you can easily stop by at this exhibition hall. You will be served a cup of tea by Mrs. Lee, who is as warm and pleasant as Master Chung. Enjoy the lovely works of art. We decided to go up to the teahouse in the exhibition hall to have some tea. 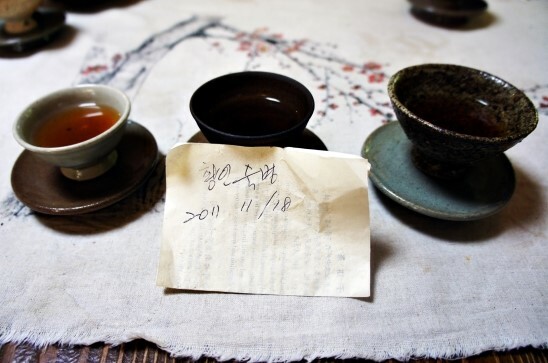 We drank from unglazed tea cups as well as some that were glazed, each featuring its own unique glaze distinct from the others. Every cup had a different taste, as if the tea they contained had not all come from the same teapot. 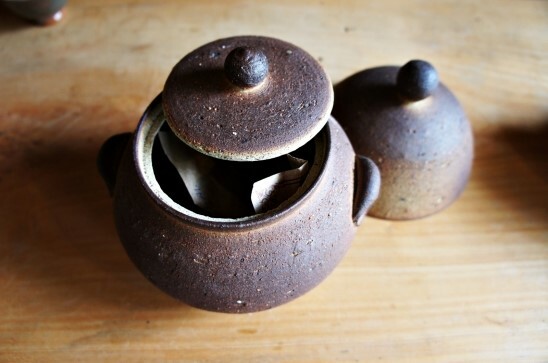 Truly, nature is amazing; the tea in a cup of fired unglazed clay not only tasted the best, but was also sweet. Now in its sixth year, Bakdalyo’s exhibition hall on Namsan Mountain is beautiful, with the fragrance of tea wafting around and wonderful people to meet. Master Chung and his wife belong to a tea club called Cheolttuk cha-hoi, a friendly group the couple became acquainted with through tea culture. For the last ten years, in conjunction with this organization, the couple has been putting together exhibitions to help needy boys and girls. These events are called ‘Donghaeng’ (roughly, Traveling with Companions). The couple performs many charitable deeds. Maybe that’s why the pottery exudes such a warm fragrance, having been baked with a benevolent heart. They say they are uncomfortable when receiving, but feel at peace when giving. You can get to Bakdalyo studio by Bus No. 505. Get off at the Bakdal 3-ri bus stop and then walk for about 10 minutes until you see the sign for Bakdalyo (박달요). Be sure to check the bus schedule first, since the bus only runs about every two hours. To get to the Bakdalyo exhibition hall, take any of the outbound buses numbered in the 500s in the direction of Naenam. Get off at the stop for Sambulsa temple or Mangweolsa temple. The exhibition hall is on the road that leads to Mangweolsa temple.